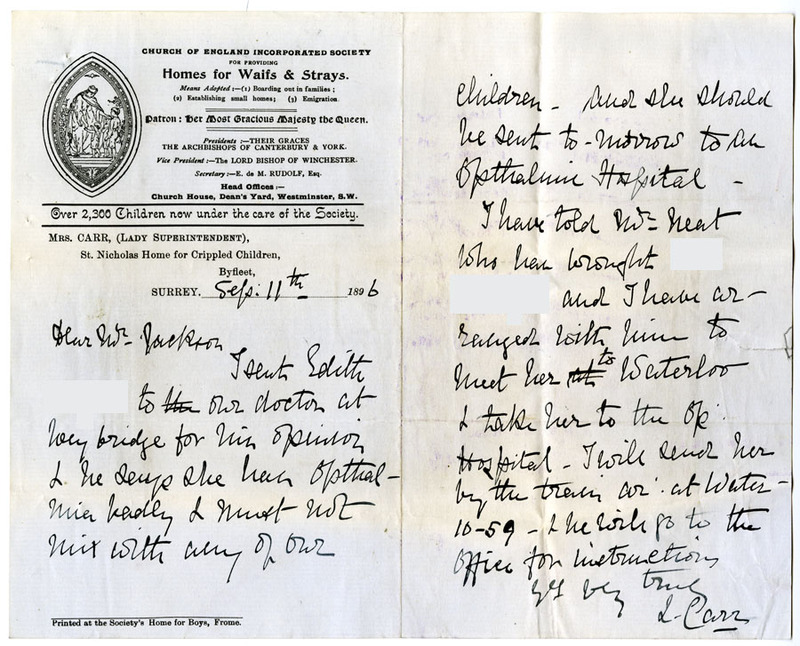 The case file for a girl named Ethel (case number 5450) is one that gives us information about turn-of-the-century treatments for ophthalmia, which is an inflammation of the eye. Born in London, Ethel’s early family life had not been a happy one as her father was said to have ill-treated her mother. Her father then left the family shortly after Ethel’s younger brother, Ernest, was born and was not heard from again. Ethel at this time was one year old. It was 1894. Things were not easy in the late-19th Century for a single mother trying to raise a young family by herself. Ethel’s mother found work in domestic service as a cook in Holloway, London. She was earning £18 per year, which was not enough for her to support two children. And so, with the help of money from a relative, Ethel had gone to live with a tailor and his family in Surbiton, Surrey, leaving Ethel’s mother to look after Ernest. Unfortunately, the relative paying for Ethel’s upkeep was on a low wage and in 1896 she could no longer afford to pay any more money. It was at this point that an application was made to The Children’s Society (then known as the Waifs and Strays Society), who agreed to help. 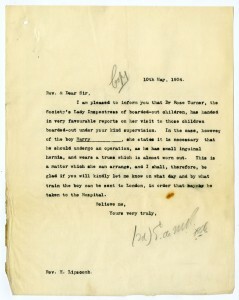 In August 1896, at the age of three, Ethel was taken into The Society’s Receiving Home in Byfleet, Surrey. After a short stay there, Ethel went to live with a foster family in Clapham, Surrey. Ethel’s new foster-parents were already fostering a boy when they took Ethel in, but Ethel wasn’t to stay there for long. Only a week and a half after she arrived, it was discovered that Ethel was suffering from an inflammation of the eye, or ophthalmia. The condition was clearly contagious as it had been caught by Ethel’s foster-brother in this short space of time. Quickly, Ethel was sent back to the home in Byfleet where she could be seen by a doctor. 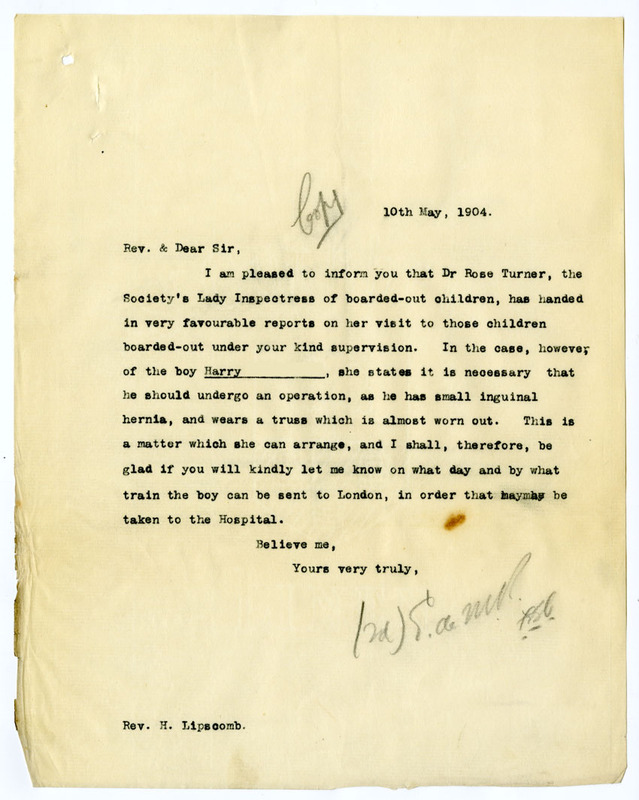 The result of the examination is detailed in the letter below (where she is referred to as Edith by mistake). & take her to the Op. 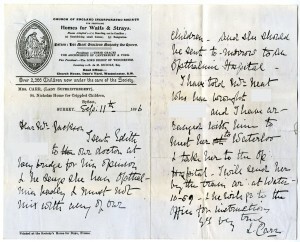 Ethel was taken to the Royal Westminster Eye Hospital in London. After staying there for almost two weeks, she was doing well and was discharged. Due to the contagious nature of the disease, it was recommended that Ethel should be kept separate from other children for a further few weeks. It was decided that it would be best for Ethel’s health if she left London and went to live in the countryside. Therefore, she was sent to a foster home in Knebworth, near Stevenage in Hertfordshire. Sadly, we find that in 1898, when Ethel was then five years old, she began to suffer from ophthalmia again. She was taken to hospital in London to be examined and her foster-mother was told that Ethel would need to return to the hospital once every fortnight for treatment. As Ethel’s foster-mother couldn’t afford to take her to London so frequently, Ethel was instead transferred to St Hilda’s Home in Marylebone, London. Presumably Ethel’s treatment was successful although there are no letters about it in her case file. She stayed in the Marylebone home until 1900 when she was 7 years old. At this point she was returned to the care of her mother, who was living near Euston Station in London. Even though Ethel’s mother was likely still working in domestic service, her letter makes it clear that she missed her daughter and wanted to have her home. We don’t know if Ethel ever went to hospital with ophthalmia again. As ophthalmia, being an inflammation of the eye, could be caused by a number of conditions, it is not possible to tell what exactly Ethel was suffering from. What we do know is that the disease was contagious, could recur after a number of years, and was serious enough to require frequent hospital treatment. If you have any idea as to what could have caused Ethel’s ophthalmia, please tell me; I’d be interested to know!